Almost 15 years since Sam Raimi’s introduction to the Age of the Superhero in Hollywood, the industry itself shows no signs of slowing down production and the battle for top comic book adaptation rages on uninterruptedly. However, quoting Christopher Nolan’s Harvey Dent, “either you die a hero or live long enough to become a villain”, things have changed in the realms of the costume crusaders. It’s not only time for a high-powered, and dim-witted, feud at DC but to Marvel’s Captain America: Civil War, which opens this week in the US after tracking pretty well in international markets. Tired of facing monstrosities from other worlds, or creations of the dark side of society, now it’s time for the biggest heroes to find, face and overcome the inner monsters. And they come in many flavors. The current question posed by both DC and Marvel tackles one aspect: the aftermath. Bruce Wayne steps up against Clark Kent upon witnessing his equally glorious, and destructive, clash against Zod in Metropolis, just as society raises more than eyebrows on the wake of the Avengers efforts to repel villains and aliens alike in the previous movies. How can the average man live amongst gods? Not very well, so it seems. After a decade and a half of superhero good deeds, and the issuing destruction, there must be limits. Checks and balances. Oversight. Control. It’s all about control, especially when self-restraint fails to kick in and the aftermath is always bloody for the little guy, the one supposed to be protected. This scenario also invokes The Incredibles, when “the supers” were overwhelmed by mankind’s need for compensation, personal justice, and accountability. However, Brad Bird’s animated classic was a bit more faithful to the source – in terms of period accuracy and reasons – than the new wave of live-action movies. Way back when, identity was an issue. Big one, actually. Now, at least in the Marvel Cinematic Universe, every hero is pretty much known and secrecy is not a problem. Thanks to Iron Man, in part. On the other hand, the writers – helmed by Kevin Feige’s guidance – were able to explore other aspects, and that brings us back to control. And, without the capes, masks, and gadgets, it all screams government x people. During the Era of Personal Rebranding and Rediscovery, everyone can be whomever we chose to, nowadays. So, identity it’s taken care of. But what about control? What about limits, privacy, security? Ever since Snowden, and most recently with Apple’s refusal to the FBI, the sense of insecurity had spiked and the average citizen, if well informed, will find many reasons to feel threatened, powerless and even cornered. It takes only a Morgan Spurlock’s documentary or any of John Oliver’s epic takedowns on technology, or government aspects, to stress the abundance of reasons. So, the entity capable of protecting (the heroes) the helpless little dots running away from the collapsing massive building (the people) has to hurt the ones it’s supposed to save in order to fulfill its mission? It’s war, ok. We got that. Steve Rodgers stresses it pretty well. He’s the soldier capable of only one thing: fight. He can’t deny his nature, his will, and his lot in life. He’s that RPG character incapable of resisting a damsel in distress and will jump into the fire to save her. Above all, he trusts his own judgment. On the other hand, Tony Stark sees the imposition of oversight over the Avengers as an opportunity to control his own unchecked actions, which had cost him his love and, possibly, his soul. As usual, Hollywood reflects social aspects and uses the superheroes as puppets to discuss deeper issues and, fortunately, Captain American: Civil War brings arguments to the table. The two sides of heroes clash over different opinions, passion for a particular ideology or their relation, or lack of, with government. “What if they send us to a place we don’t think we should go?”, somebody asks. “We need oversight; innocent people are dying”, somebody else states. The debate itself is more than welcomed, and it shows DC how this should be done, instead of the radical and superficial contest in Batman vs. Superman: Dawn of Justice. Limits must always be debated. Protection must be assured. Life has to make sense, so it can continue. 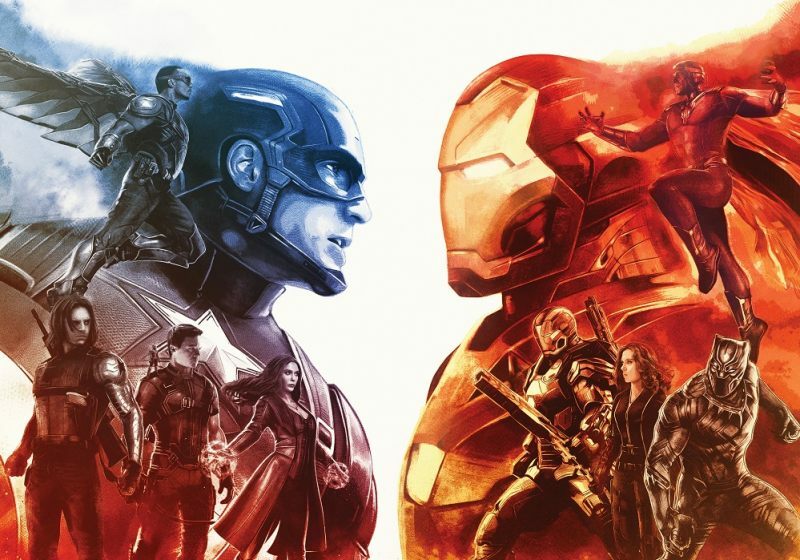 Captain America: Civil War pitches two sides trying to balance each other, like a chemical formula in need of fine-tuning. In this case, you know the formula won’t implode itself in the process and the outcome proves to be interesting, a bit bold (in comparison to the comic source material), and shows that there’s still a lot to be done. There’s no easy solution, and probably never will. This formula must be balanced from time to time, and we must be ever vigilant. The polarized scenario created and overfed by the marketing campaign asks for moviegoers to pick a side. Team Cap or Team Iron Man. It’s a long shot, but, nonetheless, a reflection of a highly volatile political environment not only in the US but in South America and Europe, with politics turning into quasi-religion, social issues being strongly influenced by hate speech and radical politicians, and a clear need for moderation. It makes you think: when you are “forced” to pick a side inside your own party, ideal, team, side of the force or family, maybe you’re also in desperate need for oversight. Heroes turned monsters can always redeem themselves after selfless acts. Real life is not as forgiving and the effects will last much more than 2 hours of awesome team fights, sorrow, heartbreaking revelations, betrayal, heroism, and discovery. Captain America: Civil War is not as raw as Winter Soldier, but keeps the debate alive and shows what’s inside the heart of true heroes: there are no sides, only the right thing to do. Tags: 2016, Captain America, Captain America: Civil War, DC, English, Iron Man, Marvel, Review.